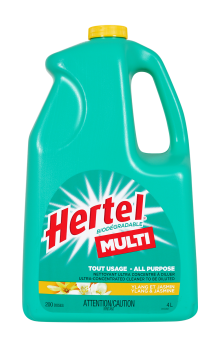 Hertel Multi is a must for household cleaning. It leaves your surfaces shiny clean, with no need to rinse or dry. 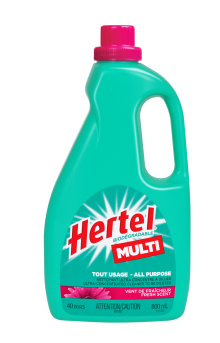 Hertel Multi is the only ultra-concentrated all purpose cleaner on the market. A little bit is enough! Its convenient container with a handle and a measuring cap allows you to control the amount of product you use. Biodegradable and phosphate-free, Hertel Multi is mild enough to be used on a multitude of surfaces. Try it on your windows and car… its effectiveness will surprise you. Let yourself be transported to the land of the rising sun, where an exotic combination of ylang and jasmine flowers will captivate you. Along this scentful voyage, you’ll discover a distinctly soft and inviting fragrance. A breath, a whisper, a kiss? You’ll be seduced by this bouquet, which leaves the very essence of romanticism in its wake. Hertel Multi is used diluted. Pour a capful (20 mL) in a bucket of warm water (8 L) and lather. Soak a cloth or mop in the solution and wring it out before wiping the surface. Then let it air dry and you’re all set! For best results, use a clean terrycloth. 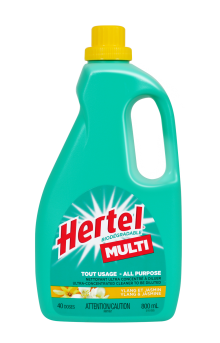 Hertel Multi is ideal for cleaning the whole kitchen, since it can be used on any surface. Pour a few drops into a sink of warm water and, in just a few swipes of a damp cloth, make the toaster oven, range hood, kettle and other small appliances shine. Then make fingerprints disappear from cabinet doors and major appliances, remove dirt from counters and dissolve grease on the stovetop. Finish it off by wiping the sink and taps, and even a few stains off the floor.